The mountain takes on a special beauty when snow covers its slopes and decorates the trees. All this snow attracts thousands of photographers and recreationists every year. Visitors of all ages enjoy playing in the snow. You may want to try your hand at snowshoeing or cross-country skiing–equipment can be rented at Paradise or Longmire, as well as in many communities surrounding the park. Free ranger-guided snowshoe walks are offered at Paradise during part of the year. Sledding devices are allowed only at Paradise, when the popular groomed sliding runs are open, usually December through March. Waterproof footwear is best for this Quest, and you may also want to bring warm gloves and hat, sunglasses, and sunscreen. The highest areas you can drive to are often snow-covered 8 or 9 months of the year. The road from the Nisqually entrance to Paradise is open year-round (except during hazardous conditions), and there is usually snow at Paradise from late November through June. When the Sunrise area opens in early July, it is usually snow-covered for a couple weeks yet. Visitors can also enjoy the late snow at other areas of the park when the roads first open in late spring or early summer: Stevens Canyon Road, Highways123 and 410, Tipsoo Lakes, and Westside Road can provide stunning snow vistas. All vehicles must carry tire chains November 1 through April 30. If you have a rental car, check with the General Store at Longmire about refundable chains (360. 569.2400 ext.1140). You can get information on schedules, activities, roads, weather, and more by calling (360) 569-2211 or visiting the park website at http://www.nps.gov/mora. The park newspaper also provides essential information. The museum ranger station at Longmire is an ideal place to start your Quest. You can check with the staff about your plans for the day and enjoy the exhibits. Don’t miss Charlie the Cougar in the central glass case; from the size of his paws, you can see he comes equipped with his own snow shoes. Ask the staff about other display animals having special adaptations for living in a snowy world. Speaking of which, do you need winter gear or supplies? The General Store near the Inn may just have what you need. The National Park Inn has a cozy dining room to enjoy before or after your Quest and can offer spectacular summit views from its veranda. When there is snow at Longmire, the Trail of the Shadows (0.7 miles, 45 minutes) often remains accessible with sturdy shoes or boots. Museum staff can direct you to this trail, where you can enjoy the snowy scenery, see mineral springs bubbling up from the ground, walk into a pioneer cabin, and see the handiwork of beavers. Or you can get directions to the nearby bridge over the Nisqually River for a quiet walk along the river and possible views of mountain’s summit. As soon as you get to the Paradise parking lots you may see eager skiers, snowshoers, climbers, sledders, and snow campers preparing to enjoy the snow. In the entry of the visitor center, note the snow depth display on the wall. Quest-ion: What is the average annual snowfall at Paradise? 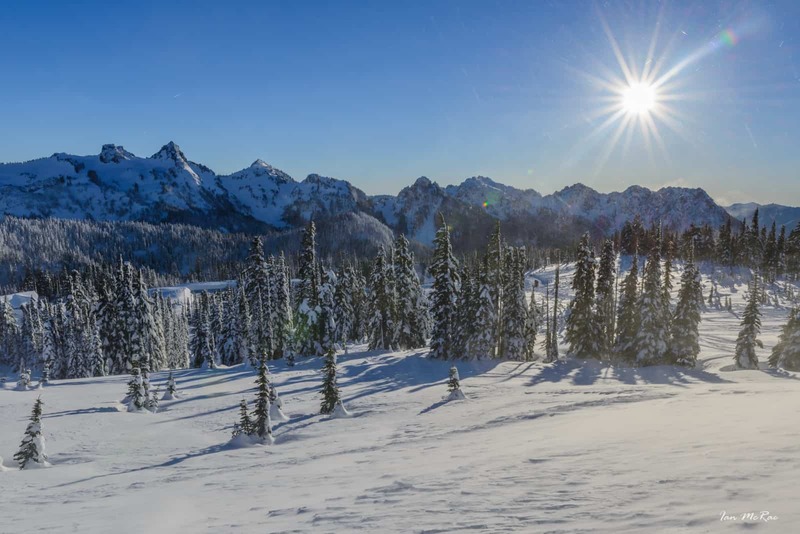 Mount Rainier is the snowiest place on earth–watch the spectacular 24-minute film in the free theater to find out why. Enjoy the exhibits in the upstairs hall and watch the short video at the Meadow Dwellers kiosk to learn how animals and plants are able to survive in this frozen landscape. If the visibility is good, the telescopes along the mezzanine will give you close-up views of the glaciers and the summit. You may even spot some climbers. To pursue your own snow adventures, pick up a snow trail map at the information desk or ask about the free ranger-led snowshoe tours (snowshoes provided). In winter snowshoes can be rented at the gift store upstairs, which also sells plastic sleds. When the snow lingers in May and June, enjoy the cozy fireplaces in the grand lobby of the historic Paradise Inn (opposite end of the parking lot from the visitor center). The corridor leading from the reception desk is lined with historic photos of the area. Look for photos of the Inn buried in snow up to its highest windows. Both the Inn and the visitor center offer food and beverages to warm you up, or you can bring your own picnic to enjoy at the indoor tables provided. At an elevation of 6400 feet, Sunrise is the highest point you can drive to on the mountain. Abundant snow often blankets the landscape when the road opens to visitors in early July. Stop by the visitor center to ask about places to walk or get a map and information for exploring the snow trails. Enjoy the exhibits and use the telescopes to peer into the Emmons Glacier–you may even spot climbers on the mountain. Quest activity: Ask a ranger to point out to you the main climbing route up the mountain. As you drive back through the White River entrance to Hwy 410, look for flattened trees and disturbed landscape where a giant snow avalanche swept across the road. Such avalanches can travel at speeds up to 300 mph–a reminder of the power of snow and nature’s awesome forces.